For a long time now, auto makers have realized that when you turn off an engine it doesn't become instantly cool, it takes time for the coolant temperature to drop. 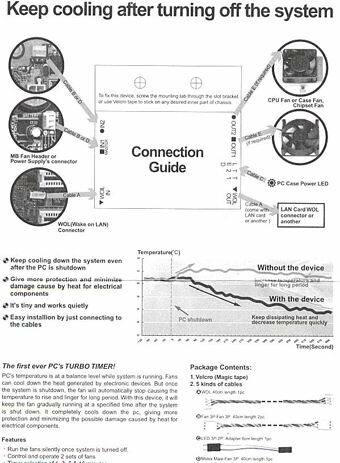 How the auto makers have addressed this on some models is to install a thermostat controlled fan that runs after the car is turned off. That same technology, in a slightly different form, is available for your computer thanks to PC Mods. The product came in a plain white box, so lets take a look at what's inside. 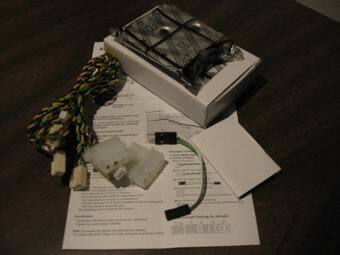 The contents of the box are: The Power Down Protector, Velcro, 1 WOL cable, two 3-pin fan cables, 1 LED adapter cable, 1 male Molex cable, and 1 female Molex cable. Additionally, there is a 1 page instruction manual. Using the P.D.P is quite simple and is a matter of plugging in the cables. Here is the instruction page. Part of the page was cut-off to allow for the connection illustration to be larger.